200 Petoskey Street is at the northern most tip of the street overlooking the waterfront. 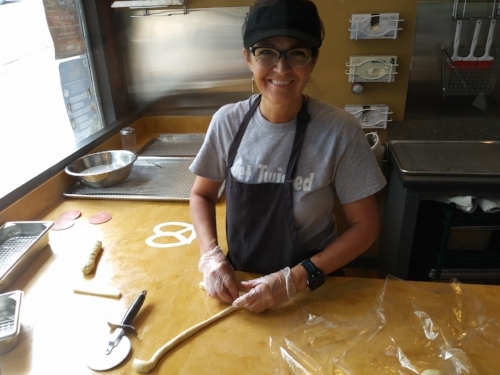 Within that corner structure, tilted to the North and East at the bottom of the hill, is Petoskey Pretzel Co. Owners, Lisa and Dave, could not have picked a better location to begin their venture. Looking around the venue, it’s easy to find the evidence. Chalkboard menus, hanging t-shirts, and even a math equation to be solved for prizes. No really! There are entry forms asking you to show your work in solving the algebra problem. Their summer has been “very successful” and they’re already talking “expansion,” but for now their menu includes: A Pretzel Frankfurter featuring a Dearborn Sausage Company all beef hotdog; a Buttery PPC Original; and for the fall season, a Pumpkin Pretzel topped with a house-made cream cheese spread. In fact, all of the major features are house-made. “We make our own dough, and create our own toppings,” says Dave. Currently, the Pumpkin Pretzel and the Cinnamon & Sugar Pretzel both are served with a cup of apple cider. “We’re going to have daily features during the winter,” said Lisa. There are samples available all day at the counter, and all of the pretzels are made fresh daily. When you walk into the cozy shop, the five-bladed fan turns slowly overhead, the chalkboards bring about romantic memories of grade school, and you can walk out with a major in comfort food. Besides the pretzel menu, there is a complete line of dips and condiments, beverages & ices, and best of all, the knowledge that your helping another new business within the comfortable confines of Downtown Petoskey. Walk on down and say hello to Dave and Lisa. They’re open every day from 11 a.m. to 7 p.m., and the pretzels will still be warm when you find a bench or table along the shores of Lake Michigan.